Orange County Personal Injury Lawyer >> Blog >> What Is California Bicycle Helmet Law? What Is California Bicycle Helmet Law? A few municipalities in California have tried to enforce helmet laws for all bicyclists in the past. However, since state law doesn’t require adults to wear helmets while cycling and tends to trump local law, those laws have fallen by the wayside — at least one to a court challenge. Of course, we recommend that all cyclists wear helmets. They can protect you from all kinds of road hazards, from stray rocks to potholes to collisions. But as an adult, you don’t have to. That said, California does have bicycle helmet laws you should keep in mind. California bicycle helmet law is focused on children and young adults. Anyone age 17 and under has to wear an approved bicycle helmet while cycling. This applies to skates, skateboards, and scooters, too. So be sure your kids are well-protected head-wise. Failure to do so may lead to fines and liability in civil suits involving biking, skating, or scooting accidents. All bike helmets worn must meet specific state standards. Avoid buying helmets that don’t specifically state that they meet California safety standards. This probably won’t be a problem in a local bike store, but online merchants often sell helmets made for other states that don’t have safety standards as rigorous as California’s. Look for “safe in California” labels. Whether the helmet is for you or your child, make sure it fits properly. We recommend you go to a bike shop where you can try on multiple helmets. Keep in mind that your children may need new helmets every year as they grow. Too large, and the helmet might obscure their vision or fall off. Too small, and it might not protect the head properly. As a rule, the more expensive a helmet, the better it’s likely to protect your child. If for no other reason, wear a bike helmet so that your children will, too. You might think that a bike helmet might not protect you at all when it comes to tangling with a multi-ton vehicle, but most bike accidents don’t involve cars. 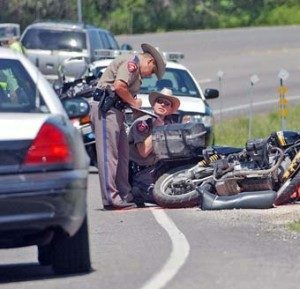 Even among those that do, you might be surprised how much a simple helmet will help. When worn with other protective gear, it can prove surprisingly effective at protecting your most vulnerable parts. Even minimizing the damage slightly can make a big difference. Humans are resilient organisms. As painful as it may be, most parts of you will heal after an injury. Your brain, however, may not. Most brain cells aren’t replaced when they die, and the brain isn’t always able to “reroute” its functions to unaffected regions. Traumatic brain injuries (TBIs) are often permanent and devastating. Even minor brain injuries can damage your ability to think, cause severe headaches (including migraines), result in concussions, blur your vision, cause amnesia and mood swings — or simply kill you, either on the spot or over time. You’re responsible for making sure your kids wear cycling helmets, so you’re likely to have some legal responsibility if they don’t and get in an accident. However, that may not be the case for you, since adults don’t have to wear helmets. Nonetheless, California law recognizes comparative blame and contributory neglect, in which all parties involved in an accident can be assigned some portion of the blame for an accident. You may be found partly at fault. Depending upon your contribution to the accident (as determined by the responding officers and the insurance company), your compensation may be reduced proportionately. That is, if you were 25% at fault and suffered $100,000 in damages, the other person’s insurance company is required to compensate you only $75,000. If you’ve suffered injuries in a bicycle accident, or have questions about such an accident, you need experienced legal advice. At Russell and Lazarus APC, we can help. Contact us at our offices in Newport Beach, Long Beach, and Riverside today to learn more.